Malta Maritime Directory :: Good Luck Paul. You can make it! - Windsurfing - Malta-Sicily Windsurf Race Record Time Challenge! Comment about: Good Luck Paul. You can make it! - Windsurfing - Malta-Sicily Windsurf Race Record Time Challenge! Good Luck Paul. You can make it! - Windsurfing - Malta-Sicily Windsurf Race Record Time Challenge! Flashback to 33 yeaars ago: 1982 - the first-ever windsurf crossing between Sicily and Malta - Paul Ellul, organiser Wilfred Sultana, and Peter Bonello. I had the pleasure to attend the launch press conference where Paul Ellul announced his plans to attempt to break the current Malta - Sicily Windsurf Race record time standing at 5 hours 56 minutes 35 seconds recorded by Jean Paul Fleri Soler 31 years ago in 1984. Paul was there on the first ever windsurf crossing from Porto Palo Sicily to Malta in 1982 with Peter Bonello being the other windsurfer. 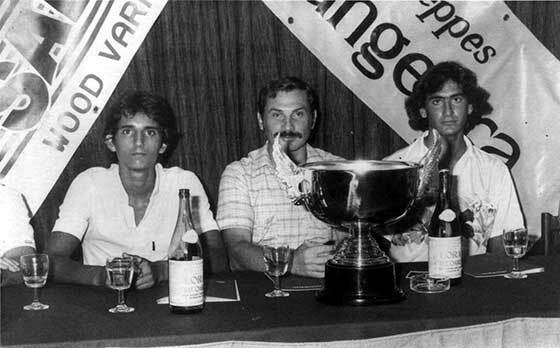 Sentimental and happy memories of than; The Wishbone Championship where the All-Rounder Award of the first edition of 1981 went to Paul Ellul, the participation of local windsurfers in the Giro D'Italia di Windsurf where in 1984 Paul was presented with the Alfa Romeo sail for his positive performance. Years have rolled on but I am sure that the enthusiastic and determined fighting spirit of the ‘young' Paul Ellul are still there. Here I would like to associate with my wishes Jean Paul Fleri Soler and Peter Bonello who together with Paul are synonymous with the Malta-Sicily Windsurf Race. I would also like to recall herewith the three officials who supported me in all Malta-Sicily Windsurf Races from 1982 to 1994, namely the late Roland Darmanin Kissaun, Jeff Poulton, Philip Attard master of 'Rockline', the yacht which escorted Bonello and Ellul on the first-ever windsurf crossing between Sicily and Malta in 1982, and all the other collaborators. Good luck Paul. Yes, you can make it!